The hoses that deliver hot and cold water to your clothes washer may not be something you think about very often, but failing washing machine hoses are responsible for $150 million yearly in flood damage. 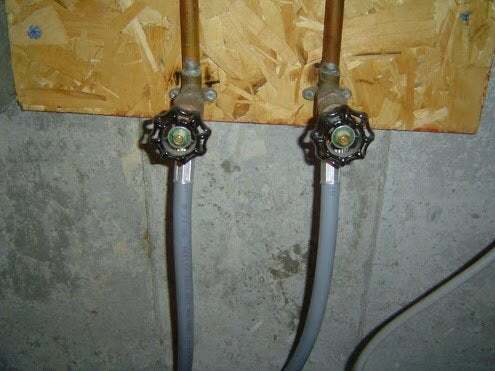 “The hoses that deliver hot and cold water to your clothes washer may not be something you think about very often, but failing washing machine hoses are responsible for $150 million yearly in flood damage. Inspect them monthly and shut off the valve at the washer when it’s not in use, especially when you go away for a while. Most pros recommend replacing rubber hoses with stainless-steel braided hose. These cost between $10 and $20 and are reinforced with a twisted, flexible steel mesh. Washer hoses should be replaced every 3 to 5 years, and they’re as easy to replace as your garden hose. Be sure you shut off the water to the machine first, run it on fill cycle for a few seconds to bleed the pressure and then unplug the machine. Grease the faucet threads and tighten the new hose connectors one turn beyond hand-tight with your wrench. Turn the valve back on and check carefully for leaks before you plug the machine back in and push it into place. Leave 4 inches of space at the back of your washer and if necessary, use right-angle couplings to keep the hose from kinking.